Christmas is running up on us, now and there are only so many hours in the day to find all of those gifts and goodies for the ones you love - so why not let me help? Here's another item on this years Holiday Gift Guide (#MGBHGG): A three candle set of Old Factory Candles! Hand poured, in the U.S.A, these candles each weigh 2oz and are set to burn up to 20 hours! These are gourmet candles, made up of natural soy wax and with cotton paper wicks topped off with scents from pure fragrance oils - aromatherapy at its best! I can't get enough of candles this time of year! There is just something so warming, homely and inviting sitting in a room by candle light and something so sweet and delicious if that room smells like gingerbread [or any other seasonal offering]. 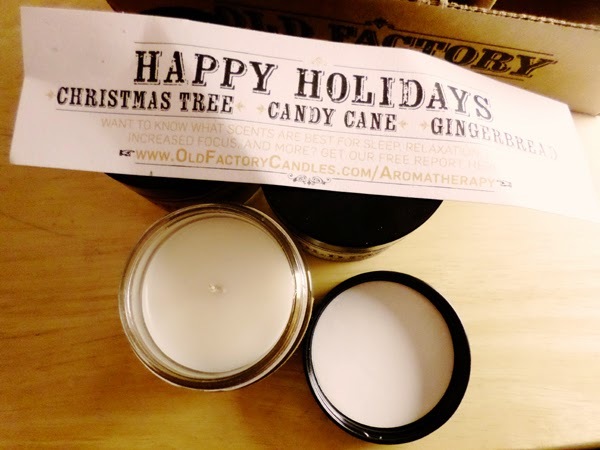 If the holiday season isn't your cup of tea , and you would prefer something else, then you can be surrounded by the scent of Man Cave or New Born Baby or even Spa Day [among other themes] - you can find the Old Factory candle set, just right for you!! I am so delighted to have these little gems in my home and I think that they make the perfect gift for for just about everyone! If you would like to find out more, or pick some up for yourself, then head on over here!! You can also share your excitement for these candles by clicking HERE and hinting at your friends and family that YOU would like some, too! If you don't want to wait around for someone to get he hint on these candles, then how about entering our giveaway, below, for your chance to win?? You must have an amazon account to be able to redeem your prize as the prize will come in the form of an amazon code. You must reside in the U.S.A and be over 18 to enter, or have your parents permission to enter. Winner will be notified via email so please enter with a VALID email address! All winners must claim their prize within 48 hours of notification or the prize will become forfeit and a new winner will be chosen - we work this way to keep out giveaways current and timely for the sponsor. Neither Mom's Gone Bronson or any blogger associated with promoting this giveaway, are in any way responsible for prize fulfillment, thank you!